Fishline will be closed today, Monday, February 4th. Client Services, Market, Second Season, all programs and administrative offices will not be open. Reminder: Our inclement weather policy follows the North Kitsap School District lead for cancellations. If schools are closed, then the food bank and administrative offices are also closed. If there is a two hour delay, then we are open our regular business hours. I vividly remember the day I began as a Fishline volunteer, nearly 10 years ago, after my friend Helen asked me to volunteer “job share” with her so she could travel without creating holes in the schedule. She wanted to be a receptionist, so I took the training as well, and my first day was at the reception desk in our tiny front market on Third Avenue. It was a terribly busy day, with a line of clients wrapping outside the door, and another line of clients waiting to see Rae, our entire Client Services team at the time. Volunteers were scurrying to get the food out to the Front Market, bumping (with good humor) into each other in the small space with an unending stream of food coming in the back door and going out the front door at the same time. I heard stories from clients that stunned me and opened my heart to adversity I had never known could exist so close to home and then I witnessed, with tears in my eyes, as good people did their best to help in any way they could. I was hooked from that first day and asked to volunteer whenever they needed me. A year later, I jumped at the opportunity to become a member of the staff and felt blessed that Fishline would take a chance on someone so unproven and inexperienced. But it turns out I didn’t have to worry much about that. From my first day on the job, I was encircled by the Fishline family who took me under their powerful wings and showed me the way. I was so touched by how patient folks were with me as I learned and grew. That circle of support never stopped and has sustained me ever since. From the start, I could see that the passion and ownership for this beloved community agency and its mission was deep and powerful at Fishline. I watched in awe as mountains of food and thrift articles were joyfully sorted with unending energy. I witnessed beautiful acts of personal generosity and compassion as staff and volunteers met clients where they were without judgment. The bonds that this work encourages has been beautiful to see – it always warmed my heart to see rocket scientists and school teachers and homeless clients standing side-by-side around a sorting table while solving world problems and encouraging each other. As if this incredible dedication wasn’t enough, our volunteers would still lay in bed thinking of how we could do better and would come up with ways to be better. Our staff and board did the same – always striving to provide the best client service possible with new ideas and fresh approaches. These inspirations were the future calling, but they often came in very humble ways. You might be surprised (but then again, maybe not) to know how many Eureka moments started with a chicken-scratched note literally written on a cocktail napkin or on the back of an envelope. Though they might have sometimes started inauspiciously, the impact of those ideas has been impactful and enduring. It was our volunteers who first came to me to talk about creating a more honoring way to distribute food, and Fishbucks was born. It was our team of staff and volunteers who insisted on a culture where positivity rules and kindness calls the shots, and the Culture of Respect was born. Because your constant hope is to help more and to help better, a new model for coordinated and expanded care was envisioned, and the idea for Comprehensive Services Center was born. You saw the potential of Second Season, convinced we could support a larger space, and the immediate, phenomenal success of our new store was sure validating. In many ways, I just served as a midwife, encouraging and supporting an evolution that was destined to be – it is truly the Fishline community that has made Fishline what it is today. I’m so blessed I have been able to be a part of this amazing time. My work at Fishline has not been just a job. It has been a vocation, a way of life, a consuming passion that has changed me in ways I could not have seen coming. I can truly say that I am one of the lives transformed by Fishline! I am grateful for every minute of it, even the hard and challenging times, pinching myself each morning as I coast down Finn Hill thinking of the privilege that awaits me each day. The privilege of standing with, and learning from, such incredible humans as our team of staff members. The honor of being inspired by the best volunteers in Kitsap County. The incredible gift of being trusted with our clients’ stories and being inspired by their resilience. The knowledge that goodness lives in the hearts of each of us and is proven every day as donors and supporters line up at the back door to give so that others may live. I’m going to miss this place and all of you so much, but there will never be a time when I drive by and don’t feel profound love and pride for this community and its heart, the people of Fishline. 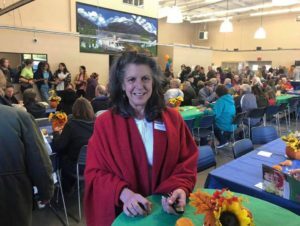 I know you will welcome our awesome new Executive Director Patti with open arms, taking her under your powerful wings to inspire and support her like you did for me. She will passionately serve this organization and her new community so Fishline can continue to be a shining example of what happens when people come together in love and service. Thank you from the bottom of my heart for allowing me the opportunity to serve you and this beautiful village of ours. Fishline understands that due to temporary government shutdown of some agencies many of our neighbors who are federal employees or individuals that work for companies that contract with the federal government are without a paycheck temporarily. Fishline also understands that many of our neighbors and clients who rely on WIC and SNAP may be unsure of the reliability of that funding due to the extended nature of the shutdown. Under these circumstances, Fishline wants to remind our neighbors that our services are available to those residing in Poulsbo, Suquamish, and Keyport with a valid photo id and address verification. Visit our quick guide for answers to questions about how to register for services: http://fishlinehelps.org/get-help/quick-guide/. If you or a loved one is impacted by the shutdown, do not let income be a barrier to receiving food assistance. If you have any questions, please do not hesitate to contact us at our Client Services number: (360)779-5190 or visit us at 19705 Viking Way in Poulsbo. Thank you! Watson Furniture donated many furniture pieces to Fishline to utilize in our new building. Here’s a short video to say thank you! While everyone at Fishline is still elated by the opening of our new market and Comprehensive Services Center and basking in the glow of our Grand Opening Celebration, we must announce a pending change in leadership at Fishline. Mary Nader, Fishline’s Executive Director for the past seven years, has decided to seek a new career challenge. Under Mary’s leadership, Fishline moved to its current location on Viking Way, implemented many innovative client programs, completed the Transforming Lives Capital Campaign, and built a new facility to house an expanded, healthy foods market and a new Comprehensive Services Center (CSC). One of the first of its kind in the nation, the CSC will house a dozen or more health and human service agencies and serve as a hub for people in need in North Kitsap county. Mary has contemplated her departure for some time but did not want to leave until Fishline was settled in the new building. With this goal accomplished, she is ready to pass the baton to a new Executive Director who can lead the organization and work with the board to continue Fishline’s service to the community. The Board took a chance on me seven years ago when it decided to choose an Executive Director who was new to the non-profit world. Thankfully, I was brought along by an incredible team of board members, staff and volunteers who showed me what it looks like to love with purpose, to help with respect and to dream without fear. Together, we have built a strong, caring, unique helping place that is on a secure foundation from which to help for decades to come. I move on from Fishline now with the abiding faith that this 51-year-old organization will continue its care of our community with the same heart and sense of mission it has always had, knowing Fishline will thrive with a new leader with the talent, experience and heart that we need at this moment. I’m forever grateful for the honor and privilege of serving you and this beautiful community. Though replacing Mary will not be easy, a search committee has been formed to recruit the next Executive Director. The application period is now closed. Interviews will be conducted in December, and we hope to have a new ED on board by mid-January. Mary will remain with Fishline until a new Executive Director is on board. For older Executive Director Reports, please contact info@nkfishline.org.